It's exactly a year today since I got my Japanese driver's license, and my "beginner" mark is coming off. 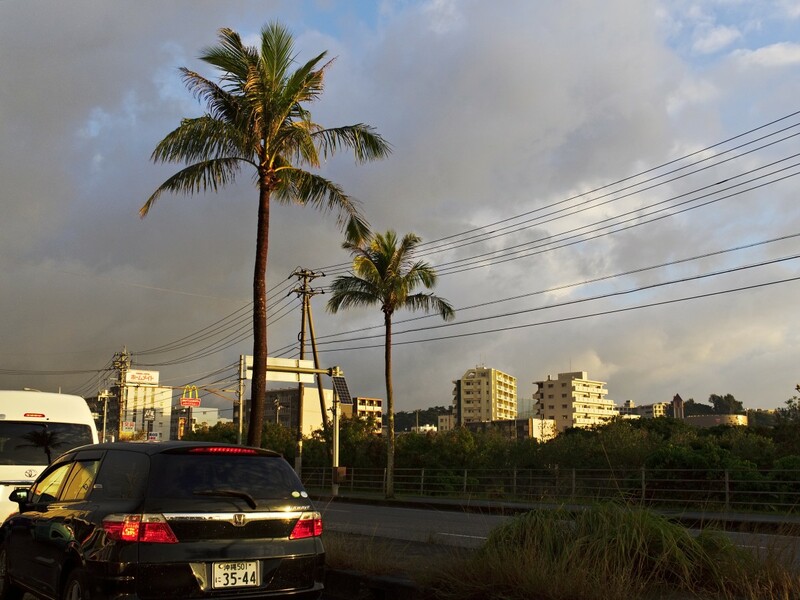 It's also seven months with the Toyota Aqua; here some early impressions of life with a car here in Okinawa. The Aqua is a hybrid compact car, tailor-made for daily commutes. 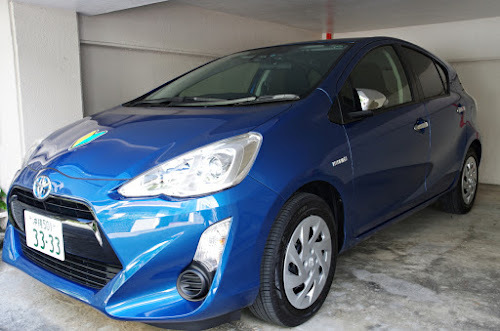 It's small — fits in any parking space — and economical, and safer than a kei-car, with features such as side airbags, collision detection, lane warnings and so on. It's big enough for four people or a fair bit of luggage if needed, but really perfect for one to two people or a couple with a baby. When we got the Aqua I hadn't driven a car for over twenty years. I was astounded just how easy cars are to drive today. You press the pedal and it goes. There's no gear-shift, no clutch, no choke, no anything. Starting on a steep uphill slope? The car stops itself from rolling down when you release the brake. Backing up? The rear camera outlines where the car will go. Need to go somewhere? The navigator will guide you. It will easily reach 100km/h — the practical top speed on Okinawas only highway — and fuel economy is good. My total average over the past seven months is just about 30km per liter or .33 liters per 10km. It varies quite a lot, though. The engine needs to warm up, so short trips use more fuel. Tire pressure and weather makes a noticeable difference, and I get much better mileage from routes I know well than when we're going somewhere new. The Aqua is not an exciting car. If cars are your hobby you won't find much to like about it. It goes where it should with little fuss, maximal predictability and minimal excitement. It's as useful and dependable as a refrigerator, and just as thrilling. That is fine. 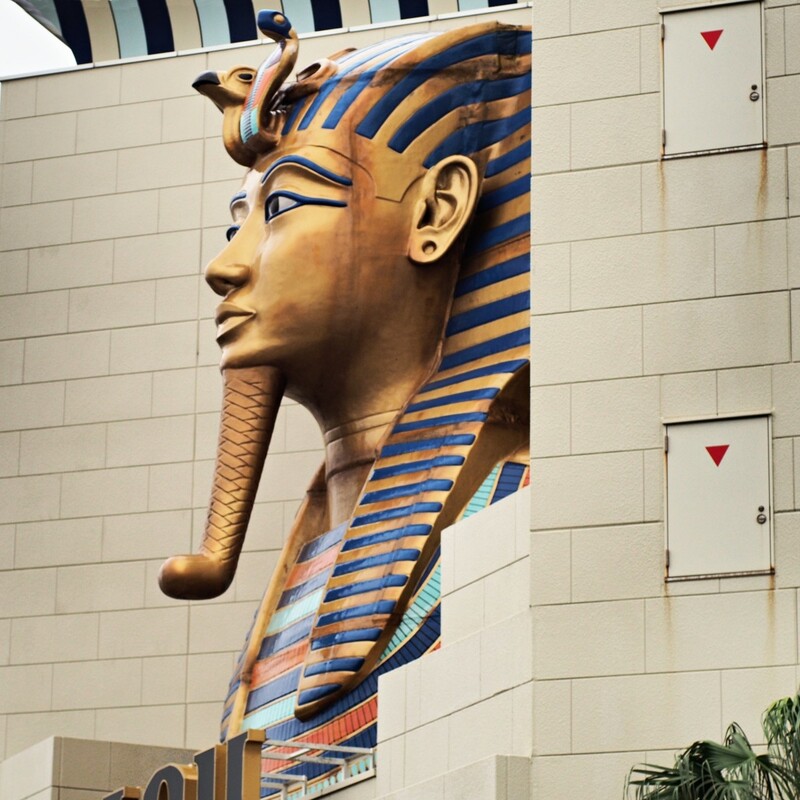 Just like our fridge is our appliance for keeping food fresh, the Aqua is our appliance for getting around. A boring commute is a good commute; it means I arrived on time, with no problems. The pachinko business in Japan is certainly at the forefront of pushing the bounds of architectural creativity, if not of good taste. Unlike the big Japanese population centers, Okinawa doesn't have a great public transportation system. The bus network is fine for short trips, but slow and unreliable for long distances. Bicycles are hampered by the hilly terrain and the hot, humid and unpredictable weather. Taxis are relatively inexpensive but still not something you can afford to use on a daily basis. That means most people have to drive whether they want to or not, so there's a lot of less-than-excellent drivers around. I freely admit I'm one of them. It also means traffic can get very congested on the few big roads on the island. Speeding is everywhere. 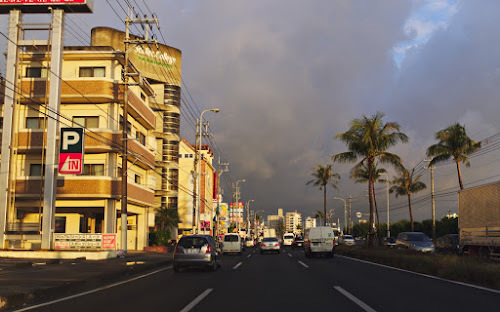 For some reason, Okinawan roads have quite low speed limits. A straight, wide 4-lane road that would have a limit of 70 or even 90 km/h back in Sweden is here perhaps only 50. Also, while all speeding is illegal, the penalties are very mild up to 20km/h over the limit — one point off the license and a 10-15k yen fine. The police are much more concerned with drunk driving and serious offences so they will mostly ignore moderate speeding. That means just about everybody is speeding. The actual speed on Okinawan roads is generally the posted limit + 15-20km/h. Even police cars are speeding along with everybody else. The only exceptions are driving school students; trucks and delivery vans that follow a company policy of keeping close to the speed limit; and some elderly drivers. 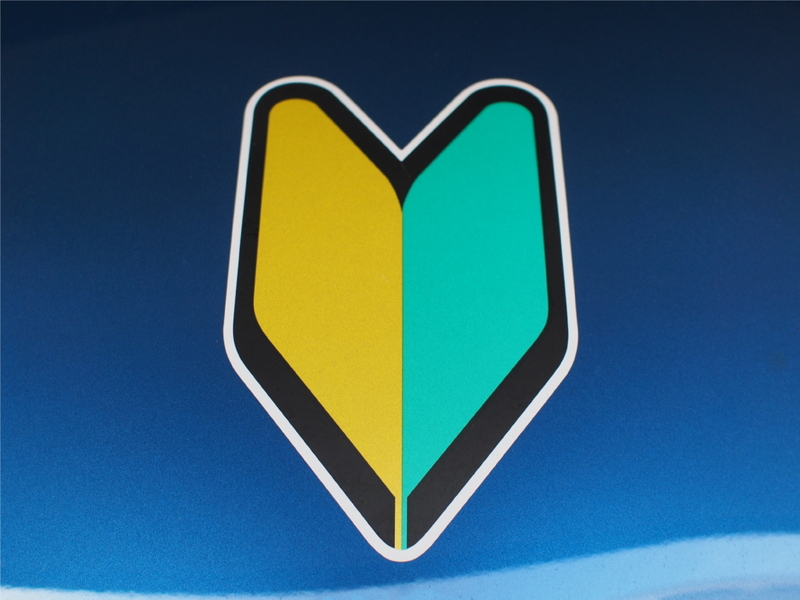 Speaking of elderly drivers, and of new drivers such as myself: the "beginner" mark I've been using, and the "disabled" and "elderly driver" marks, are a great idea. All new drivers have to use the beginner mark for the first year, while drivers over 65 can use the elderly driver mark if they want to. They warn other drivers that your experience, reaction time, cognitive capability or perception is lacking so you need a bit more leeway to drive safely. If a driver gets into an accident with you, they will be held to a higher level of responsibility because of your status. It really seems to work; people do give these cars a bit more space. I know I do myself. This is a button. It's in every car. In some places it's called a "hazard light". On Okinawa this is the "instant parking space" button, and it's magical. Wherever you stop — no matter how busy or inconvenient — the moment you press this button the spot turns into your personal parking space. The magical "make parking space" button. It could be one lane on the main artery during rush hour, in a sharp bend over the top of a hill, or completely blocking a narrow one-way road — it doesn't matter; once you press that button it becomes your parking space. Quite amazing, really, what we can do with technology these days. Drunk driving is a big problem here. It's of course connected to the lack of public transportation, combined with a culture of regular social drinking. 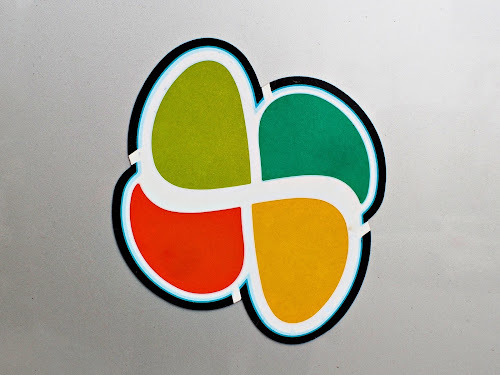 One solution: daiko, or drive-home taxis. They exist elsewhere in Japan too, but are very common here. You call a daiko service, and two drivers show up in a small car. One of them drives your car and the other follows in theirs, while you ride along as a passenger in your own car. They're more expensive than regular taxis, but not by that much — they're subsidized I believe. If you're not living that far away, and if you share the cost with 2-3 other people, it can be very economical. Rush hour traffic along Route 58 is actually not too bad if the weather is cooperating and nothing happens. If I leave work at six it takes me 1:25-30 or so to get home, compared to 1:10-15 if I leave at six thirty. The problem is that if something happens — an accident, a concert or some other event — then the rush hour time can easily become two hours. 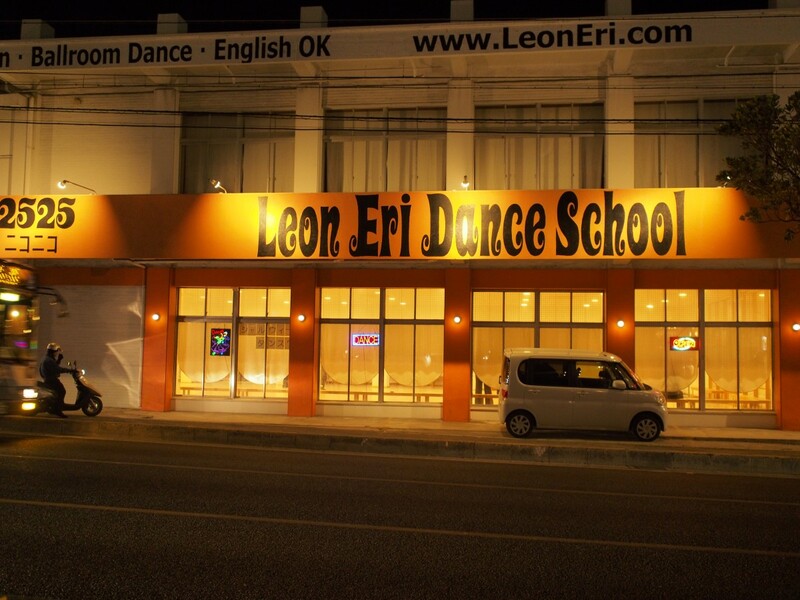 Leon Eri Dance School. Taken while I was stuck in an endless jam in Ginowan. I absolutely love the typography. On Friday evenings, there's always things happening, and the traffic is always hideously slow, so I take the highway. It costs 650 yen each time, but it's worth it to get home in just over an hour instead of two hours or more. But overall, Okinawa is a good place to drive. Most drivers aren't stressed or rushed, and the pace is fairly relaxed. People are tolerant, give each other space, let each other in and generally cooperate even when the traffic grinds to a complete halt. People say a car broadens your horizons, and they're right. We get to many places we otherwise couldn't. We often go to farmers markets, beaches and restaurants that we really couldn't reach otherwise. The markets especially is a great place for very inexpensive, insanely fresh seasonal ingredients. It's a lot of fun. Palm trees in the morning. But a car is also terribly inconvenient. It's a bulky, expensive, dangerous machine that needs constant maintenance and attention. When you drive, you need to be awake, alert and focused — no reading, dozing off or daydreaming. Driving really is wasted time. You can't suddenly stop or change direction because you saw a neat-looking cafe or something. And parking is always a problem. The car hurts my photography. There's lots of photo opportunities here — I have a list of cool spots longer than my arm already — but in a car I can never just stop, take a picture, then be on my way. It means ten-minutes of finding some place to get off the road, turn around and go back, then find a place to stop so I can walk over to the spot. By that time the scene is already long gone. 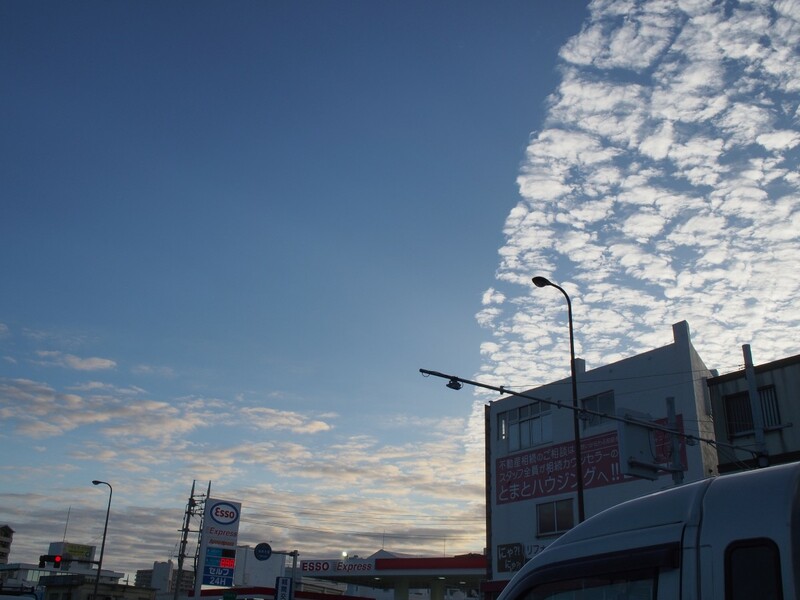 This cloud line one morning was absolutely unbelievable. It stayed completely straight and unmixed for over an hour.